Postcards from Home typically tells about buildings a century or so old. Too often, the subject has been demolished leaving only pictures to document its existence. Even when a building is still standing, its current appearance often is different from the postcard illustration. This “new” Federal Building and Post Office building is sometimes resented for displacing historic Spencer Square park with its band shell, statues, and gardens, still beautiful in our mind’s eye. Yet it is clear that the Federal Building is important to Rock Island and that its design reflects the 1950s era. Will we think it is worthy of preservation? That’s a question we can’t answer today. But here are some of the facts. In the early 1950s, the City Council finally agreed to swap Spencer Square park for the old post office site on 2nd Avenue and 16th Street. Construction of the new building was delayed when the land swap was challenged by heirs of the original donors of the square, but ultimately that court battle was lost. 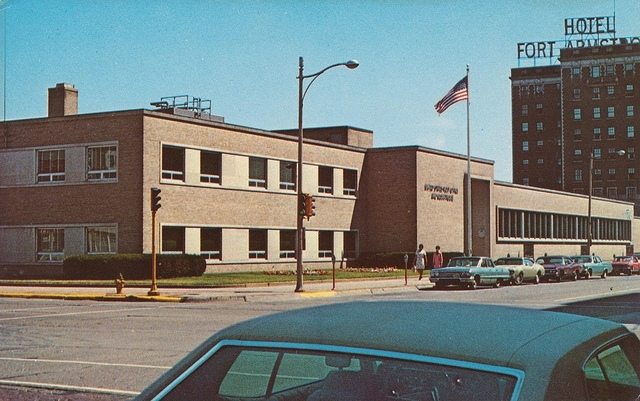 In 1956, the General Services Administration (GSA) approved the $2 million architectural design by J. Fletcher Lankton and John N. Ziegele of Peoria, and local architect William Stuhr. The plans were praised as “an excellent example of contemporary architecture,” free of “needless and costly embellishments,” resulting in “a design which is simple (with) clean lines pleasingly predominant.” That description also neatly summarizes 1950s architectural styles, establishing a degree of period cachet. Moreover the new building was historically unique as well. It was the very first building completed under the federal Lease-Purchase Act of 1954. That act allowed a private contractor, in this case Henry G. Beck Co. of Dallas, TX, to build using private financing, then recoup the investment by renting to the GSA for a period of 20 to 25 years. At the end of that time, the GSA would own the building. An important fact is that during the years of private ownership, real estate taxes would be paid on the building. Only after the GSA took it over would it be removed from the tax roles. With overall dimensions of 293 x 170 feet, the building provided 51,000 usable square feet for offices for seven federal agencies; courtrooms, including two jail cells; and the post office, each with individually controlled air conditioning. On Nov. 6, 1957, Argus writer Dean Collins provided a detailed description of the new building, noting the buff brick face covering reinforced concrete construction, the 7-foot fixed windows on 19th Street, and the beautiful light tan St. Genevieve Rose marble from Missouri in the 19th Street lobby. That lobby, centered on 19th Street, was bracketed by a two-story section to the north and a one-story post office section to the south. The dedication on November 7, 1957, was attended by local and national dignitaries. Among them were Mayor Warren Yerger; Edson O. Session, the Deputy Postmaster General; and Senator Everett Dirksen. Another participant was former Rock Islander Edward C. Sweeney, then General Counsel for the GSA, whose wife, Catherine Hauberg, was also a Rock Island native. Mr. Sweeney’s speech mentioned that his grandfather, Attorney Edward D. Sweeney, had built the nearby Sweeney building in 1885. Although the building sign texts have changed and the post office has moved to the north wing, today’s main difference from the old postcard seems to be in the autos. Even the large, aluminum-framed windows, a defining feature that express the character of the 1950s, are intact. Care has been taken to replicate the original lettering of the attached signs when the building functions changed. And that rose marble is still in the courthouse lobby. Because this is such a long building, it’s hard to get the full visual impact of the 19th Street side. As with other large structures, it often takes a closer examination to appreciate the architects’ original concept for this sleek, strongly horizontal, building. One unexplained design anomaly is the unscreened functional back of the building that faces 20th Street, a major thoroughfare. Perhaps the unaesthetic aspect of loading docks and parking that once faced a large railroad depot and nearby taverns was an attempt to visually turn the Federal Building’s back on that area. What will the future say about the Federal Building? Will it even be there? Will it be considered worthy of formal preservation efforts? That is hard to predict. One thing for certain – if the ongoing maintenance continues to respect the original building design, it will keep its architectural integrity. That is important for all structures, whether historic or not. This article by Diane Oestreich is slightly modified from the original, which appeared in the Rock Island Argus and Moline Dispatch on June 4, 2006.